Our culture is a scientific one, defining what is natural and what is rational. Its values can be seen in what are sought out as facts and made as artefacts, what are designed as processes and products, and what are forged as weapons and filmed as wonders. In our daily experience, power is exercised through expertise, e.g. in science, technology and medicine. 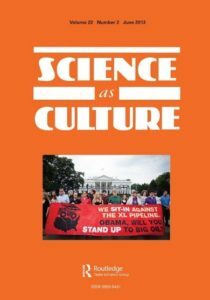 Science as Culture explores how all these shape the values which contend for influence over the wider society. The journal encompasses people’s experiences at various sites – the workplace, the cinema, the computer, the hospital, the home and the academy. The articles are readable, attractive, lively, often humorous, and always jargon-free. SaC aims to be read at leisure, and to be a pleasure. So reads the mission statement of the journal since its foundation in 1987. The focus has been publicly important topics, especially ongoing controversies or potential ones. Such topics become the rationale for engaging with concepts from STS, cultural studies and wider political debates. These linkages have made the journal attractive to a broad readership across and beyond academic disciplines. SaC was the successor of the Radical Science Journal (RSJ), which had emerged from 1970s critical science movements. This flourished under the broad umbrella of the British Society for Social Responsibility in Science, which published the magazine Science for People. As its activists argued, technical fixes were defining societal problems in ways that strengthen elite agendas for class exploitation, gender oppression and environmental degradation, while technicising and thus depoliticising such issues (Bell, 2013; Werskey, 2007; see http://www.bssrs.org/home). Contributing theoretical perspectives to those strategic debates, the Radical Science Journal drew on concepts from counter-cultural, feminist, environmentalist and alternative health movements. From Critical Theory of the Frankfurt School tradition, the key concepts reification and fetishism were extended to technique and expert knowledge. As already noted by historians, basic scientific concepts have always depended on old or new metaphors; RSJ analysed how these naturalise specific values as properties of facts or artefacts. The critique drew on Marx’ insight, ‘This fetishism of commodities has its origin in the peculiar social character of the labour that produced them…’ By analogy, scientific facts likewise were shaped by social relations of scientific labour yet were fetishized as products of Nature (Young, 1977). Members participated in the Labour Process Group within the Conference of Socialist Economists, informing analyses of science and technology as a labour process. ‘Capitalist science’ resulted from a labour process constituted by capitalist social relations, e.g. a division of labour, professional hierarchy, proprietary knowledge, etc. (RSJ Collective, 1981; Werskey, 2007: 439). Together these concepts highlighted the implicit politics in elite agendas, while linking diverse cases around a common framework. Labour process perspectives were further elaborated in a two-volume collection (Levidow and Young, 1981 and 1985). The Editorial Collective had close links with social movements and political campaigns, which generated topics for RSJ’s monthly series of public events. Members included academics (in the Sociology, Philosophy and History of Science), medics, science teachers, psychotherapists and various political activists. 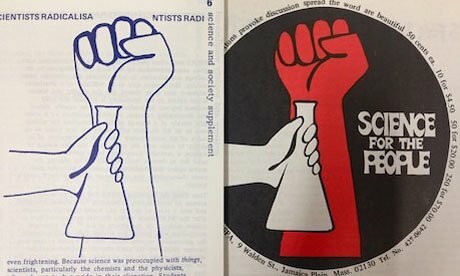 The Radical Publications Group provided a wider platform for regular discussions amongst critical journals on science, statistics, history, philosophy, social work, political economy, etc. RSJ Editorial Collective members also attended an annual international meeting of critical journals. These included Naturkampen (Denmark), Cahiers Galilee (Belgium), Science for the People (US), Kerala Sastra Sahitya Parshad (India) and Contrainformazione (Italy), as well as mass-circulation magazines such as Wechselwirkung (Germany) and Sapere (Italy). These annual discussions helped to sharpen critical perspectives on issues such as chemical disasters, automation, nuclear power, nuclear weapons, techno-torture, new reproductive technologies, etc. (Levidow and Vitale, 1981). RSJ drew on perspectives from early STS, cultural studies and feminist studies. For example, a 1985 special issue analysed ICTs as Compulsive Technology, a title which has even greater relevance today (guest editors: Tony Solomonides and Les Levidow). A 1987 special issue explored how power is gendered and mediated through notions of science, technology and nature (Gender and Expertise, guest editor: Maureen McNeil). Meanwhile cultural studies were analysing how technoscientific developments set agendas for expert authority, social identity and social order. These interdisciplinary synergies provided a basis for the successor journal. For most of the UK’s critical journals in the 1970s, an Editorial Collective handled the entire production process including subscriptions and bookshop distribution. From the early 1980s onwards, however, Thatcher’s neoliberal Britain was closing down the spaces for such political alternatives and work modes. Critical journals depended heavily on substantial voluntary labour, which was becoming more difficult to sustain. For their public exposure and sales, they depended on bookshop distribution, but fewer journals were being stocked. For these reasons, most of the UK’s critical journals turned to commercial publishers, even whilst recognising that these might limit readers’ access through copyright restrictions and commercial pricing. 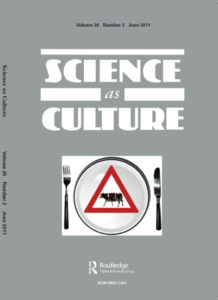 Given those general constraints on critical journals, alongside new opportunities for interdisciplinary exchanges, the Editors decided to replace RSJ with a new journal, Science as Culture (henceforth SaC). In the mid-1980s the Editors had founded a new press, Free Association Books, which now became the SaC publisher, but depended on at least five journal distributors across several continents. These arrangements were soon simplified by switching publisher to Guilford Publications (NY) and then Carfax (UK), which in turn was acquired by Taylor & Francis; its STS journals list helped to raise the profile of SaC. Why science as culture? As noted in the first issue, our everyday mundane and aesthetic experiences are already mediated by technologies, becoming ‘so much part of household furniture that we no longer experience them as technologies’. Although technological applications were sometimes debated as issues of values and power, their design priorities rarely underwent such scrutiny. And scientific knowledge remained largely invulnerable to critique, especially in the wake of science popularisation. The mass media eagerly cater for a growing market which looks to scientific knowledge for enlightenment, entertainment, diversion…. Thus we have an abundance of science-as-culture, but it is primarily for consumption, much less often for debate about choices of values and priorities. The alternative to science-as-consumption is cultural critique (SaC Editors, 1987). Hence SaC has analysed ‘the production of meanings in scientific culture and in the broader culture as influenced by science’ (ibid). Although now positioning itself as an academic journal, SaC articles always went beyond academic disciplines and issues. Articles analysed power relations, labour processes, cultural meanings, their naturalisation and societal conflicts in diverse forms and sites. SaC presented itself as an STS journal critically analysing technoscience in its many manifestations. Open to diverse disciplinary perspectives, SaC became a crucible for the interdisciplinary exchanges characterising STS. Transdisciplinarity explicitly orients its knowledge production not only around disciplinary problem-definitions but also around other definitions, derived from pressures, ‘applications’ or from societal stakeholders…. [Yet] different stakeholders may have different views about what the problem at stake actually is… (Maasen et al, 2006: 396). Starting from such societal conflicts, SaC articles have analysed agendas for reordering society, their stabilisation through expertise, and their destabilisation through resistances including counter-expertise (e.g. Fortun and Cherkasky, 1998). This transdisciplinary perspective has many resonances with critical STS (e.g. Jasanoff, 2004; Jasanoff and Kim, 2015; Kleinman and Moore, 2014; Pellizzoni and Ylönen, 2012). Beyond research articles and book reviews, SaC has analysed tensions within STS. According to one critic, STS epistemological debates about truth or objectivity obscure contests over power and alternative futures (Hamlin, 2007). Johan Söderberg (2017) contrasts a ‘political economy’ tendency with a post-structuralist one, while tracing their differences to legacies from 1970s Marxism. SaC welcomes more articles on such tensions, especially why these matter for practice. For the journal’s remit on the wider culture, a recurrent focus has been popular media and exhibitions, particularly how they celebrate technoscience. A 1995 special issue analysed Science on Display (guest editor: Sharon Macdonald). Other essays on exhibitions include Angela Last (2017), ‘Making nature, making energy, making humans’. More such contributions are sought. Special issues have generated and juxtaposed diverse perspectives on a topic. Through early discussion with the SaC Editors, the guest editors have sharpened the conceptual approach, drawing on more critical perspectives from STS and beyond. Reviewers of the papers include fellow contributors, whose own papers have benefited as a result. “What does it mean that energy systems are at once relatively hidden from public scrutiny and yet deeply structuring of social and economic arrangements that can stifle alternatives without our realizing it? Who knows about energy systems, what and how do they know, and whose knowledge counts in governing and reshaping energy futures? And what does it mean to implement a just energy transformation that will neither perpetuate the existing negative impacts of energy production and use nor create new ones?” (Miller et al., 2013). ‘Agro-Food Crises’ (guest Editors: Anne Loeber, Maarten Hajer and Les Levidow, 2011) examined the late 20th century agro-food disasters that were experienced as societal crises. Key actors made sense of these crises through specific risk framings that linked social and natural (dis)order in new ways. Contributors took a discourse-analytic approach to those societal conflicts and incipient agendas for institutional change. To sharpen debate, SaC Editors have introduced topical Special Forums. These bring together articles of under 6k words, many written by non-academics, with a fast review procedure. This format provides a flexible means to scope new topics, to gather multiple critical approaches and to highlight their political relevance. Public unease or antagonism towards some technoscientific developments has been a recurrent topic in SaC. Readers showed great interest in an article by Ian Welsh and Brian Wynne (2013), ‘Science, scientism and imaginaries of publics in the UK: passive objects, incipient threats’. They argued that elite strategy has shifted away from incorporating public unease, instead treating it as politicised threats requiring state control or even suppression. This article became the focus for a Forum on ‘Publics as Threats to Technoscientific Progress’ (2015). Forums have taken up several other topics. ‘Embedding Social Sciences?’ (2014) critically analysed policy roles of the Social Sciences and Humanities (SSH). This started from an article questioning whether SSH were being appropriated for dominant policy agendas: ‘the call for “embedding SSH”, within lines of reasoning already predefined by sciences and engineering, translates a hierarchy and potentially limits SSH in developing its full potential’ (Felt, 2014). The Forum on ‘Contested Technology from the 1970s to the Present’ (2016) reflected on the 1970-80s radical science movements, drawing lessons for today’s analogous agendas. ‘Techno-Economic Assumptions’ (2017) analysed economic assumptions that pervade expert judgements about knowledge, technology design and government policy. Future special issues will include the following topics: ‘Alter-Standardising Clinical Trial’s (guest editor: Achim Rosemann), ‘Techno-security Cultures’ (guest editors: Jutta Weber and Katrin M. Kämpf), ‘Urban Techno‐Politics’ (guest editors: Thaddeus Miller and Rider Foley) and ‘Justice and Counter-Expertise’ (guest editors: Sharlissa Moore and Logan Williams). This builds on a 1988 special issue, ‘Strategising Counter-Expertise’ (guest editors: Kim Fortun & Todd Cherkasky). SaC is widely available through e-journal systems. Most publishers have shifted their business models from individual subscriptions to thematic ‘bundles’, e.g. STS and cultural studies, several of which include SaC. Its downloads have been rising every year; some papers of broad interest are available as free downloads. The journal has two levels of organisation. Everyday operations have been run by four people: the Editor Les Levidow, two Associate Editors in Kean Birch and Uli Beisel, and Book Reviews Editor Martin Savransky (previously David Tyfield). Advisory Panel members play important roles in advising on strategy, publicising the journal and reviewing submissions. Advisory Panel meetings are held regularly at EASST and 4S conferences. Both the special issue and Forum formats offer opportunities for early-career academics to serve as guest editors. They gain experience in editorial judgements and responsibility, working with the SaC Editors. Several guest editors have joined the SaC Advisory Panel. Fortun, K. and Cherkasky, T. 1998. Guest Introduction: Strategising counter-expertise, Science as Culture 7(2): 141-144. Hamlin, C. 2007. STS: Where the Marxist critique of capitalist science goes to die?, Science as Culture 16(4): 467-474. Jasanoff, S. (ed). 2004. States of Knowledge: The Co-Production of Science and Social Order. London/NY: Routledge Taylor & Francis. Jasanoff, S. and Kim, S.-H. (eds). 2015. Dreamscapes of Modernity: Sociotechnical Imaginaries and the Fabrication of Power. Chicago: University of Chicago Press. Levidow, L. and Vitale, B. 1981. International meeting of radical science journals, Radical Science Journal 11: 101-110. Levidow, L. and Young, R.M., eds (1981) Science, Technology and the Labour Process, vol.1, London: CSE Books. Levidow, L. and Young, R.M., eds (1985) Science, Technology and the Labour Process, vol.2, London: Free Association Books. Pellizzoni, L. and Ylönen, M. 2012. Neoliberalism and Technoscience: Critical Assessments. Farnham/Burlington, VT: Ashgate.